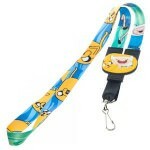 Are you a huge fan of the television show Adventure Time? If so you will love to have your own adventures when you play with this Adventure Time 6 action figure set. This Adventure Time 6 figure pack features an assortment of all your most favorite Adventure Time character’s like Finn, Jake, BMO, Marceline and more from the television show. They come in six 2 inch size collectable figurines and would be perfect for gift any fan that like to collect keep sakes or a child that loves to play. Get ready for some crazy fun Adventures when you play with this Adventure Time 6 Figure Set.